The Log People produce, supply and deliver fully seasoned ready to burn hardwood, softwood, kindle and sawmill off cuts. 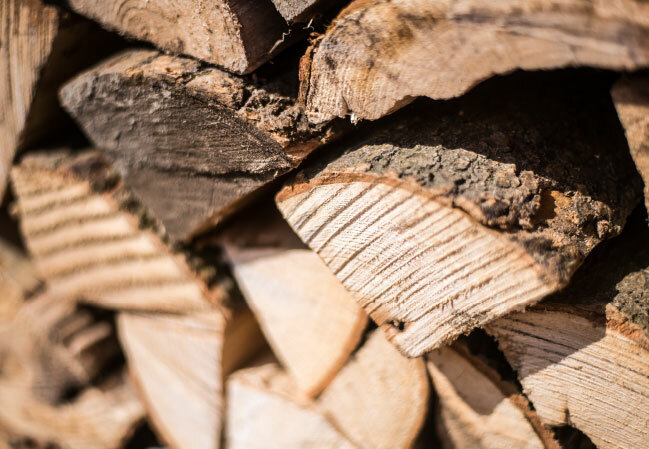 Our logs are dried to an average moisture content of 20% or less – complying with the Government’s Clean Air Strategy and ideal moisture level for burning in wood burning stoves or open fires. Our supplies come direct from the mill and we work with British grown timber responsibly sourced from sustainable FSC-managed woodlands. How big are the nets? Our nets of logs measure 45x60cm. In fact, customer feedback tells us our nets of logs are bigger and packed tighter than what’s available elsewhere. And we’re much better on price too. Our prices start from just £2.75 a net – and the more you buy the more you save. If you want logs that burn hotter for longer you’ll love our seasoned hardwood logs which start from £4.75 a net. Yes. We regularly check the moisture content of our logs and we aim for the logs to have as close to 20% moisture content or less. As such, you shouldn’t get any excessive smoking or spitting from your logs – which usually happens when burning wet and unseasoned logs. When we run out of dry logs we stop selling. We only ever sell logs that are ready to burn. What types of firewood do you supply? We supply fully seasoned ready to burn softwood, kiln dried hardwood, and sawmill off cuts. We also supply kindle and natural firelighters if you decide to add them to your order of firewood. The quickest and easiest way to buy logs is to shop online but if you prefer to order over the phone please call us on on 01691 887977. Don’t know where to start? Don’t panic! There is no such thing as a silly question! Just give us a call or drop us a line and we’ll help you get your fire started in no time! Hardwood logs are much more dense than softwood logs – so you’ll find hardwood burns hotter and for longer than softwood. Having said that, if you try to get your fire going using hardwood, it’d be like trying to light a brick! That’s why we recommend burning both types of wood by firstly building your fire up with seasoned softwood and switching to seasoned hardwood to sustain the burn. You can, of course, burn seasoned softwood on its own if you want to. Softwood is a lot cheaper to buy than hardwood – but softwood also burns away quicker too. So if you love the novelty of putting another log on the fire then softwood will give you plenty of practice. However, if you want to kick back and relax after getting your fire going, we recommend switching to hardwood logs as they will sustain the burn of your fire for anything up to five hours! After a bit of both? Order our Half ‘n’ Half Firewood Bundle – and get 1 net of kindle FREE!. If you’re interested in the science behind it all then do read on! Hardwood logs are denser than softwood logs because hardwood species such as Oak; Ash and Beech take up to 100 years to reach maturity. In contrast, softwood species such as Pine; Larch; Spruce and Douglas Fir grow much faster than hardwood species and take up to 30 years to reach maturity – so softwood is less dense and, as a result, easier to light than hardwood. That’s why we recommend using softwood to build your fire and hardwood to sustain the burn. I’m new to wood burning. What should I order? Everyone needs to start somewhere! If you’re new to wood burning our Firewood Starter Pack is a good place to start. Our starter pack contains everything you need to get your fire started. Here’s what you get, and our tips for how to get started. 1 box of 50 natural firelighters – nestle 1-2 firelighters between the kindle and light with a matchstick / lighter. 10 nets of kiln dried hardwood – after a few minutes you should have a roaring fire. To sustain the burn just add 1-2 hardwood logs to sustain the burn (because hardwood logs burn longer than softwood). Please note that this advice should not replace the guidance provided by your stove fitter and stove manufacturer. These are just tips that work well for us. How long will my log order last? This is why it’s virtually impossible for us to tell you how long your order will last. And every customer has different requirements too! Some like to use a mix of softwood and hardwood, others just like softwood and others just order hardwood! It all depends on what works for you and your household. The best advice we can give is to place an order, see how long it lasts, and use that as your yardstick for placing future orders. Where can I burn the logs? 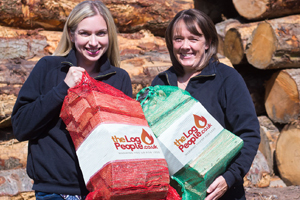 Our logs are suitable for wood burning stoves, open fires, chimineas and fire pits. Whilst both seasoned softwood and seasoned hardwood are both ideal for wood burning stoves we would only recommend burning hardwood for open fires because softwood has a tendency to spit. How big are the logs? The logs are split and cut to around 10 inches in length – making them suitable for wood burning stoves, open fires, chimineas and boilers. Please bear in mind no two pieces of wood are ever the same so please account for variances in the wood. When laid flat our nets measure 45x60cm. We generously pack out our nets with logs – leaving virtually no room to get another one in! Our aim is to always give you the best possible value for money. Firewood logs should only be sold by volume and not by weight because the wetter they are the more they weigh. This is because a net of well seasoned logs will offer twice the amount of energy from the same size net of unseasoned logs. That’s why firewood logs should only ever be sold by volume. How big are the dumpy bags? Our dumpy bags measure 85x85x85cm – making them almost 1m3. Why do you only deliver dumpy bags to certain areas? Our log processing sawmill is based in Oswestry, and because we deliver logs in Luton Transit vans, we are restricted to carrying a maximum of four dumpy bags in each van. As such, it is only economically viable to deliver within a small radius of Oswestry. Just so you know 20 nets is the rough equivalent to one dumpy bag. So if you were looking to purchase a dumpy bag of logs and you don’t live in one of our dumpy bag delivery zones you can order the equivalent amount in nets (20 nets to 1 dumpy bag). Yes. We purchase British grown timber that is sustainably sourced from local FSC-managed forestries – where there is a commitment to plant two trees for every single tree that is cut for our usage. How much do I need to spend to get free delivery? To keep things simple as simple as possible all you need to do is order at least the minimum order quantity for your area to quality for free delivery. You can order as many logs as you like as long as you meet the minimum order requirement for your area. The minimum quantities vary depending on where you live – so have a look at the table below to see how many nets or dumpy bags you need to order. You can order anything you like – so long as your order meets the minimum order thresholds for your area. The more you buy the more you save – so stock up on as much firewood as you can to get the best possible value for money. We aim to deliver your order between Monday and Friday and within 3 working days of your order – subject to availability. When the weather gets colder we put on extra delivery vehicles to meet demand – so you shouldn’t have to wait long between placing your order and getting your delivery. If your order is delayed for any reason we will contact you. Before placing your order please read our delivery terms and conditions. It is important you read these conditions as there may be factors in there that could affect the delivery of your order. We deliver logs Monday to Friday in daylight hours. However, as the weather gets colder, we are much more flexible and we put on extra delivery vehicles to meet demand. If your order is delayed for some reason we will contact you to let you know. Sadly we cannot give specific delivery times because we deliver multiple orders on the same vehicles and delivery routes are generated once a van is full. As such, we ask our customers to be flexible with when they can accept their log deliveries. For added convenience we can deliver logs in your absence if you wish. We can leave your logs at the front or side of your property – but just let us know when you place your order. When you place your order online we will contact you to acknowledge receipt of your payment and to arrange a mutually convenient date for us to deliver your logs. When you check out you can tell us which delivery dates would be ideal for you and we will do our best to make it happen. We deliver logs to the following areas free of charge – so long as customers meet the minimum order requirement for their area. We are happy to speak to customers outside these areas who may be interested in larger quantities. Please call us on 01691 887977 to discuss your requirements. Why do you only delivery dumpy bags to certain areas? There are two reasons why we’re restricted to where we can deliver dumpy bags of logs. Firstly because our sawmill is based in Oswestry, and secondly, we can only fit up to eight dumpy bags in our vans. As such, it is only economically viable to deliver to areas within a reasonable distance of Oswestry. I need to cancel or rearrange my delivery date. Can you do this? You can cancel or rearrange your delivery date by giving us at least 24 hours notice before your delivery was agreed. This is because we will have already loaded your order onto our vans for delivery. Can I collect the logs instead of having them delivered? Yes. You are welcome to collect and buy logs from our sawmill, at Maes Y Clawdd, Oswestry, Shropshire, SY10 9NN. We’re open Monday to Thursday from 9am to 4pm and Fridays from 9am to 3pm. Please note that we offer a delivery only service to the Chester, Deeside, Ellesmere Port, Frodsham, Liverpool, Llangollen, Malpas, Oswestry, Shrewsbury, Welshpool, Whitchurch, Wirral and Wrexham areas. What type of vehicles do you use to deliver the logs? Your property needs to be accessible for a large Luton Transit Van with a tail lift. Please ensure there is enough space for us to access your property. What sort of access do you need to get to my property? Hand pump trucks cannot be operated on loose gravel. Without reasonable access to your property your order will need to be left at kerbside.